Amyloidosis, fibrillary glomerulonephritis (FGN), and immunotactoid glomerulopathy (ITG) are all characterized by renal deposits with an organized substructure under high power electron microscopy. Traditional nomenclature has categorized these diseases in part based on the diameter of the fibril, with amyloid fibrils being 10-12 microns, fibrillary size typically in the 18-20 micron range, and immunotactoid microtubules being larger than 30 microns. Additionally, the Congo red-positivity with birefringence under polarized light has, in the past, classified amyloid from non-amyloid diseases such as FGN and ITG. However, a recent report by Alexander et al published in AJKD highlights that rarely Congo Red-positive biopsies are actually FGN, and that a specific biomarker for FGN called DNAJB9 can be identified via mass spectrometry when the glomeruli are evaluated after laser microdissection. Panel A below demonstrates a biopsy specimen of fibrillary GN with Congo Red glomerular positivity, and Panel B demonstrates yellow/green birefringence under polarized light. Panel F demonstrates the substructural appearance of these deposits on EM. Example of Congo Red positivity in congophilic fibrillary GN (original magnification, ×100). Figure 1A from Alexander et al, AJKD © National Kidney Foundation. Example of Congo Red positivity in congophilic fibrillary GN (original magnification, ×100). Figure 1B from Alexander et al, AJKD © National Kidney Foundation. Mesangial randomly oriented straight fibrils are seen on electron microscopy (original magnification, ×40,000). Figure 2F from Alexander et al, AJKD © National Kidney Foundation. Mass spectrometry analysis of the congophilic FGN samples compared to Congo-negative FGN, amyloid, and healthy kidney tissue reveals that this disease does not contain the amyloid protein signature as seen in true amyloid. 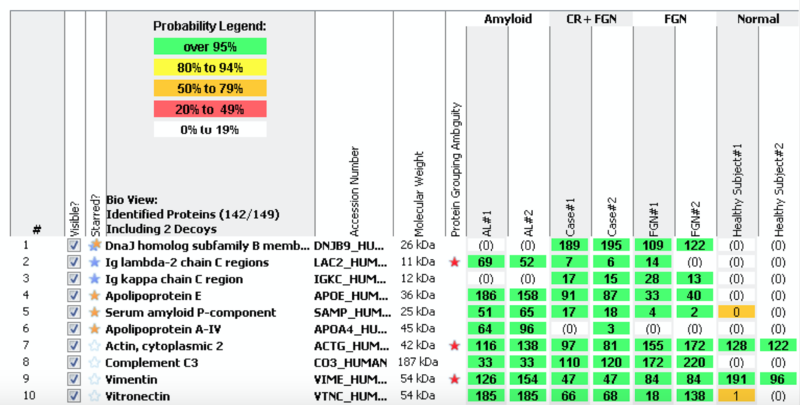 Although some of the traditional tissue markers such as APOA4, SAP, and APOE can be slightly increased in congophilic FGN, they are not raised to the levels seen with amyloidosis. Even more striking, a unique tissue marker called DNAJB9 was detected, and was unique to FGN irrespective of congophilia (see Panel C below). Protein marker for FGN is highlighted with a double star. Proteins that are markers for amyloid type are highlighted with a blue star. Generic amyloid tissue markers were highlighted with a yellow star. Numbers in boxes represent the normalized number of tandem mass spectra matches for the respective protein in each sample. Figure 3C from Alexander et al, AJKD © National Kidney Foundation. 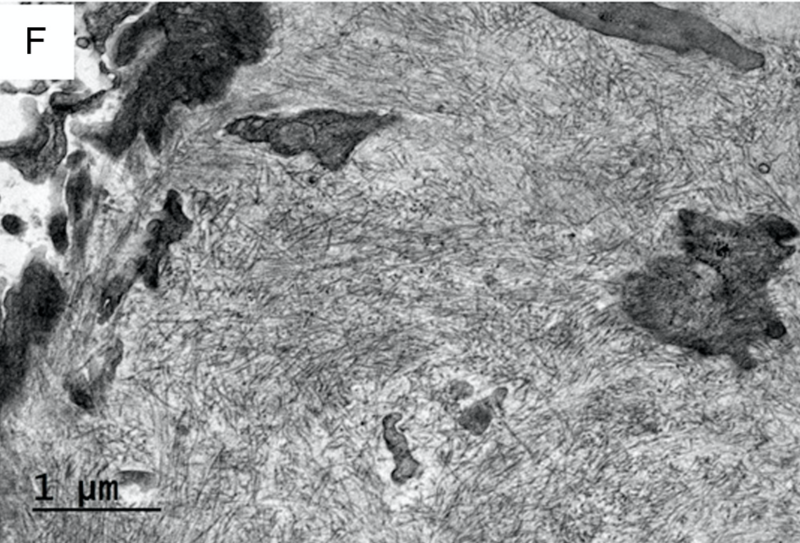 Additional immunohistochemistry staining for DNAJB9 in congophilic and congo-negative FGN demonstrated both glomerular and extraglomerular staining in the arterioles and peritubular capillaries (see Figure 4 below). In comparison, none of the 21 amyloidosis cases tested stained positive for DNAJB9. Immunohistochemistry for DNAJB9. Glomeruli show strong smudgy mesangial and glomerular capillary wall staining for DNAJB9. Similar smudgy deposits are focally seen in the wall of a small interlobular artery (arrows) (original magnification, ×200). Figure 4 from Alexander et al, AJKD © National Kidney Foundation. This #PathPointer demonstrates the evolving importance of proteomic analysis of these complex diseases. Since the 1920s, Congo Red dye was shown to specifically stain amyloid deposits in tissue and has been considered the pathologic gold standard for amyloid disease. With the development of glomerular microdissection and mass spectrometry-based tissue analysis, we are moving nephropathology into the future, where proteomic biomarker analyses are now the standards for classification of these diseases. Hopefully, these discoveries will translate to novel treatments for our patients. 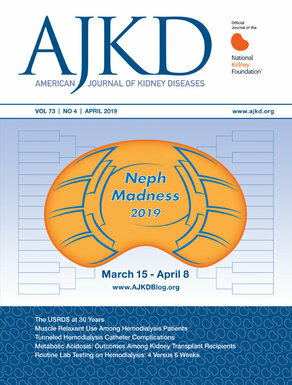 To view the Alexander et al article (subscription required), please visit AJKD.org. Additional PathPointers are available in the AJKDBlog archive. 1 Comment on #PathPointer: Congo Red-Positive Always Means Amyloid Deposits, Right?